Matching a paint to the suitability of an application is an art. These steps can help make sure facility managers get what they want. Given the options available in different paint formulas, how can facility managers determine which is a quality paint suitable for an application? There are no formal standards that rate quality; there simply are too many variations in paint formulas for fair comparisons to be made. There are, however, several steps that facility managers can take to ensure the paint that is being applied is a quality paint. Look at past performance. If the project is a repainting of the area, what brand and type of paint was used there before? How well did it hold up? Look at other similar areas in the facility and see how well the paint that was applied there is performing. Be aware though, paint manufacturers are constantly adjusting their paint formulas either to improve performance or to reduce costs. There are several rules of thumb that can be used to help ensure the selection of a quality paint. 1. Quality and price. Quality tends to track price. In general, the higher the quality of the paint, the higher its price. Higher priced paint tends to have a higher volume of solids and higher quality ingredients. Price is not a guarantee, but it is a good indicator of quality. 2. Percentage of solids. Since the solids are the only material left on the surface after the liquid evaporates, the percentage of solids in a can of paint is an indicator of the thickness and quality of the protective paint film. 3. Prime pigments. Prime pigments, such as titanium dioxide, provide better coverage. 4. Concentration of binders. A higher percentage of binders in the paint will improve performance by resisting cracking and peeling. One of the main sources of information on paint ingredients is the paint manufacturer. When evaluating options, contact the manufacturer’s representative to get information on paint ingredients: types of pigments and binders used, percentage of solids, and what other additives are used. Review the Material Safety Data Sheets (MSDS) for possible paint choices. The MSDS will list several characteristics that are indicators of the quality of the paint: weight per gallon, specific gravity, and the quantity of solids by percent of volume and by percent of weight. 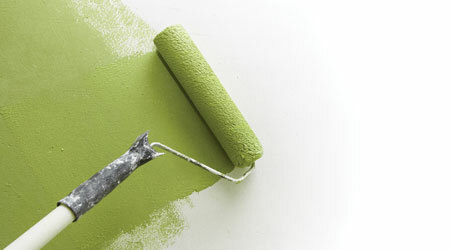 A range of organizations that have developed evaluation and rating procedures for paint, including ANSI, ASTM, Green Seal, and the Master Painters Institute. These organizations have set standard requirements for content and testing procedures that manufacturers must adhere to if their paint is to be certified as meeting that standard.